Those look really nice. I very much like the dark tones you have achieved in the uniforms. Isn't the problem always never enough command figures??? Ah well, where else would you show your conversion chops? The Confederates look fantastic, Paul. A really earthy looking crew - loved the photographer! I really like them Paul! Great paintjob! I always say you can't judge how good a Strelets figure is until you see it painted. But when the painting is this good it takes them to a different level. These are very good looking figures. They look very nice! Hmm (thinking hard) ....... (scratching my head) ........ (lightbulb!)! You have painted the Airfix sets too! How do they look together? Bill Slavin wrote: Isn't the problem always never enough command figures??? Sorry for the late answer. That there´s only the one command sprue is a bit odd and for me making 20 bod units it means half the set gets put into the spares box. Another command sprue would mean I could get two units from each box. IMHO, a bit of a waste but hopefully, and I´m not holding my breath, HäT might release a ACW command set or Strelets might have a brainstorm and sell command sets on thier own. In contrast to the wargamers in our community I would say, a ratio of ~40 soldiers and a command unit is ok, if you are building a diorama. In this case you need more "normal" guys and not a lot of officers. The contrast is Italeri. In their sets you have three drummers and flagbearers. This is useless the other way around... A question from which side you look at it, of course. Btw. 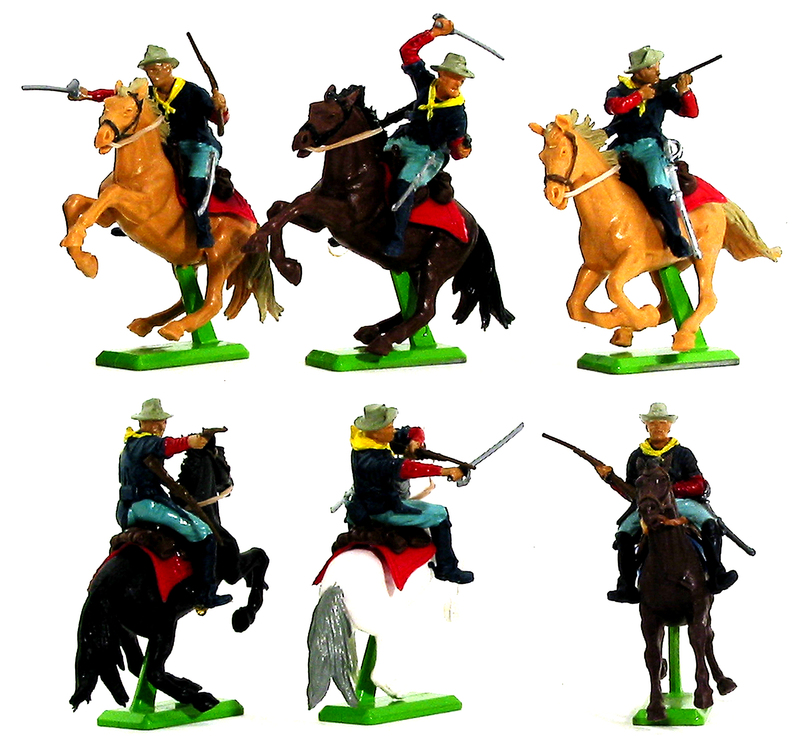 I like the range from Strelets and it is good to have some more sets for the ACW. And you did a good job on the figures like always, Paul. Imho the green is a bit to artificial but that can be discussed for sure. MABO wrote: Imho the green is a bit to artificial but that can be discussed for sure. The basing is "Old school"
Hmm, I've seen better painted Britain's. 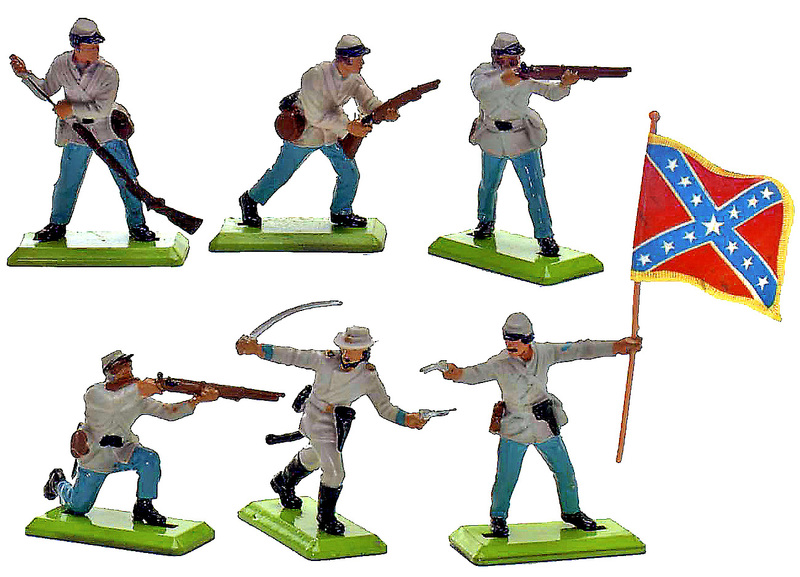 Had a confederate cavalry trumpeter and a union cavalry flag guy (no, that's NOT the proper title, but it sounds a little funnier) as a kid and they looked quite good. Until we took them apart and mixed them up and eventually lost the parts. Whatever, your's Strelets look really nice as usual. Paul wrote: The basing is "Old school"
Old memories are coming up when I see this kind of figures!